Kale, eggs, feta and fresh fruits and vegetables combine to make the breakfast of champions. Local eggs are my thang. I used to work in an office where I had fresh cage-free, local, organic eggs delivered every week or so, and people thought I was kind of crazy. I would come upstairs with this carton of eggs containing every color egg you can imagine, but I have to tell you, those eggs are tastier and probably healthier than conventional eggs, and it made me feel good to be supporting a local person. How fun would it be to raise chickens?! Crack your beautiful fresh eggs into a bowl and add a splash of milk and a few cracks of black pepper. Scramble the eggs together and set aside. Melt the butter or heat olive oil in a medium-sized skillet. Chop your red onions and add them to the butter/oil, let cook for about a minute over medium heat. Once the onions have softened, add the kale and allow it to cook for 2-3 minutes, until wilted but still bright green. Remove the kale and onions from the pan and pour in the scrambled eggs. Cook eggs until they are just set and then add the cubed feta and the kale + onions back into the pan. Stir to re-heat and allow the eggs to cook to your desired doneness. Serve alongside fresh tomatoes, fruit, toast, lemon water, or whatever else you need to start your day off right! Go out there and be awesome! Apple cinnamon oatmeal is the perfect breakfast for Fall; it is warming, healthy and comforting- the perfect combination. In this recipe, old fashioned oats lend a heartier texture while fresh apples and a hint of cinnamon give this satisfying breakfast a happy Autumn vibe. The best part? You can make it year-round! This version is much better for you than the instant oatmeal that you would make from a packet, which is loaded with sugar and salt. You can let this oatmeal simmer on the stovetop while you wake up slowly on a weekend morning, or even while you rush around getting ready for work on busier days. This oatmeal’s burst of fresh harvest flavor is surprising given how simple it is to prepare! I love cinnamon in my oatmeal, but if you are in the states or you are savvy with spices, you can awaken your senses even more by using a fragrant pumpkin pie spice blend instead. 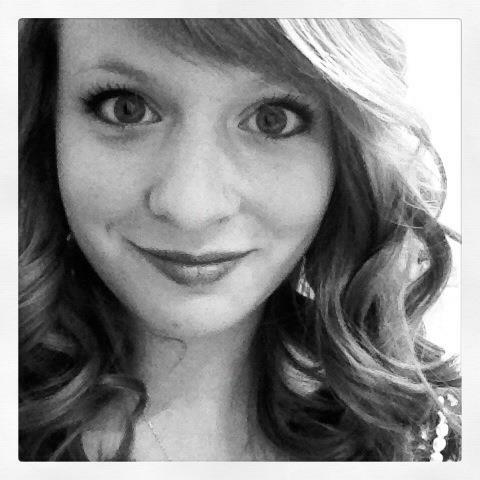 Hello, Fall! Wash the apple and grate it using the medium ribbon side (the side you probably usually use that produces short ribbons). Bring the water to a boil and add the oatmeal and half of the grated apple. Cover and cook for 10 minutes. Uncover and add half of the remaining apple and the cinnamon. Cover and cook for 2 more minutes. Uncover and add the last bit of apple and more cinnamon to taste. Mix in the date honey or your choice of sweetener until it is a sweet as you like it. Spoon the oatmeal into a bowl and top with a splash of cream or milk. Enjoy! Meatless Monday Special: Veggie taco bowls with golden sauteed onions and peppers, fresh arugula, smooth avocado, sharp cheddar and zesty spice and lime, all served over a bed of rice. My obsession with this dish cannot be put into words. Meatless Monday has become quite the popular buzz word in the food blogging world, but it has yet to become an event at my house. Most of our meals are marked by a centerpiece of protein, usually either grilled brown sugar glazed salmon or pineapple chicken. I have to preface this recipe by saying that these bowls are delicious beyond words, to the extent that after I made the first one I proceed to make it again and again for both breakfast and dinner for the next 3 days. No exaggeration. There’s something magical about perfectly cooked and fragrant rice topped with melted cheddar and spiced vegetables… a fried egg for breakfast makes it all the more perfect. Heat water in a pot until boiling and add 2 tsp salt and the juce of ¼ lime. To the boiling water, add dry rice and cook according to package directions. Make Pico de Gallo: chop tomatoes, cilantro, onion and jalapeno and combine with lime juice and salt. Try to not eat all of it before your meal. Chop onions, bell peppers and garlic, reserving the garlic separately. Heat olive oil in a medium sized skillet. Once the oil is hot, add the onions and bell peppers and saute until the vegetables begin to caramelize and begin to take on a brown color (this is best achieved in a stainless steel skillet, not a nonstick). At this point, add the cumin and garlic and saute for another minute or two just until fragrant and the garlic is softened. To serve, spoon cooked rice into a bowl and top with freshly grated cheddar cheese. Add fresh arugula, sauteed veggies, pico de gallo and sliced avocado. Serve with a lime wedge. For breakfast, serve with a fried egg on top. Enjoy! My favorite breakfasts are always centered around farm fresh eggs; scrambled eggs with herbs, a soft boiled egg with lots of fresh pepper, or a fried egg with a simple breakfast salad like this recipe. Nothing keeps me full like eggs, especially when paired with some kind of fresh fruits and/or vegetables. I first began my journey with fresh eggs was when I read about the health benefits of cage-free eggs and signed a petition to only purchase cage-free. After a drawn-out, non-stop ridiculous battle with my parents when I moved home, I quit eating eggs altogether when they refused to make the switch to cage-free. My days suffered; adjusting from 1-2 eggs per day to none took a toll on my mood, attention span, energy level, and more. Later, a friend told me that you can actually search on craigslist to find local, farm-fresh, cage-free, organic eggs. I could not believe it! The second that I got home that night, I got on Craigslist, and sure enough I found multiple families near me who kept chickens and were looking to sell the extra eggs. After exchanging a few emails, I found one family who sold their eggs for $3 a dozen, which is the same price or cheaper than organic cage-free eggs from most grocery stores! I seriously was floored, and every time they drop off my eggs at my office, I cannot express enough gratitude. These eggs are the most beautiful eggs I have ever seen. They come from hens who have names, who have the run of the property each day and are put to bed safely in their coops each night. The colors of my dozen are always a surprise, a wonderful mix of beige, brown, white, green and blue. Sometimes there is even a stray feather floating around. I always sit impatiently through the rest of the day at my desk, plotting the breakfast-for-dinner when I get home with my eggs. 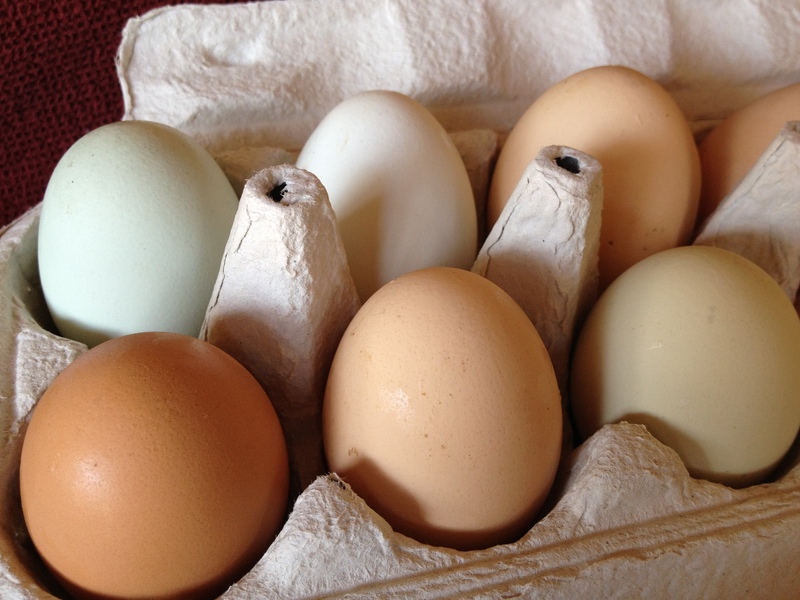 The difference between these fresh eggs and conventional eggs is profound. 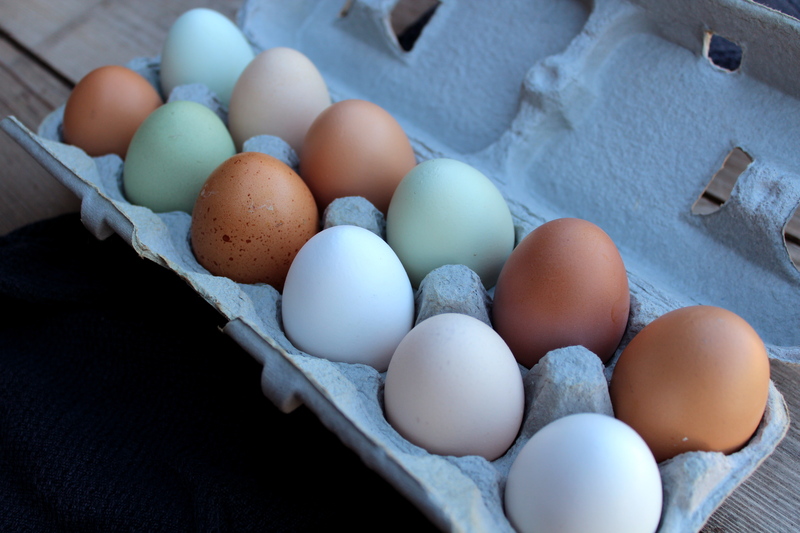 The farm fresh eggs crack open differently, and the “white” part is very clear, never cloudy. The yolks are often so deep yellow that they almost appear to be orange. 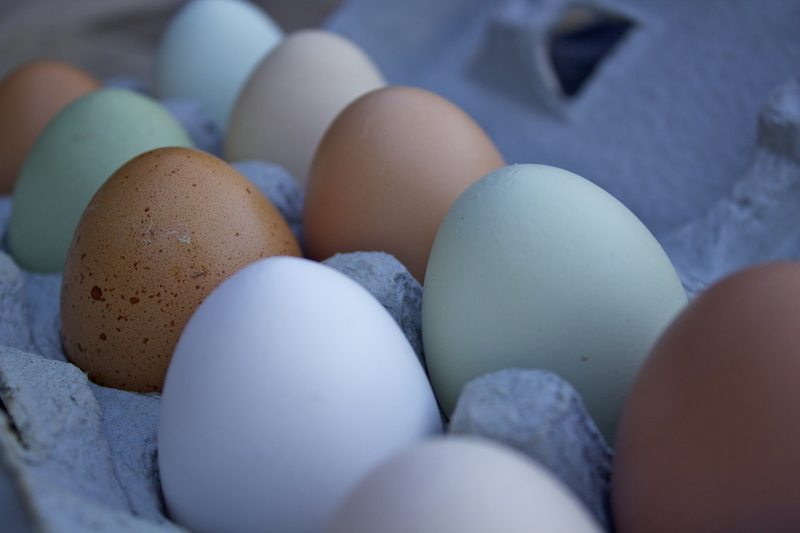 There has been research done that shows that the depth of color of a yolk directly correlates with its level of vitamins and other nutrients. So, now that I’ve gone on and on about my crazy passion for fresh eggs, here is a recipe to help you enjoy them, if you can get your hands on some! Melt butter or oil in a skillet over medium heat and spread around the pan. Crack the egg directly onto the center of the pan. Allow to cook slowly until the white has set, but the yolk is still soft. Gently flip to cook the opposite side, but allow the yolk to stay soft. While the egg is cooking, mix together apple butter, balsamic vinegar, olive oil, and pepper. Whisk vigorously until all ingredients are combined. Toss your desired amount of dressing with the mixed greens and top with pomegranate seeds. Spread goat cheese onto the flatbread. 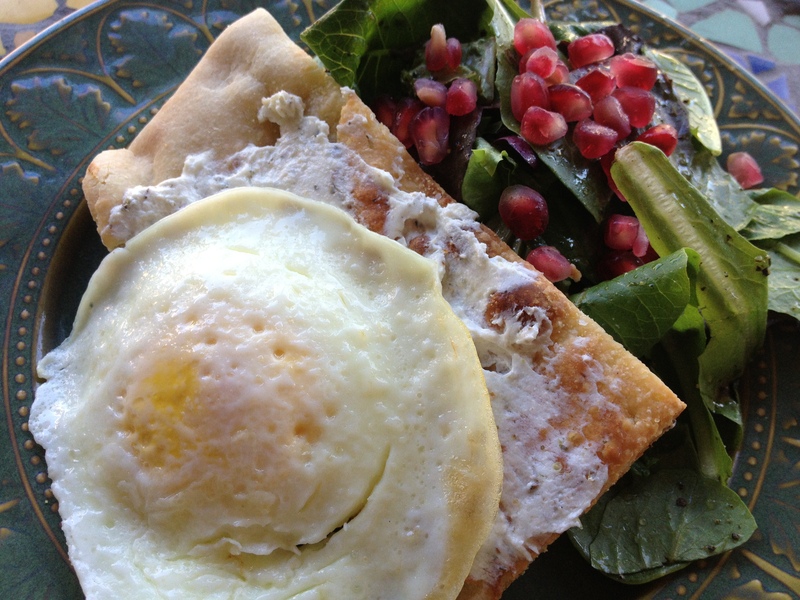 To finish, gently place your fried egg on top of the flatbread.